Ever since Revenge of the Sith left theatres, we have heard about George Lucas’s next two Star Wars related projects: an animated tv show set between Episodes II and III and a live action show set after Anakin gets all medieval on his Jedi friends over a girl. Bro’s before ho’s, Anakin, jeez. This week, we officially got word that the animated show, Clone Wars, will debut this Fall on the Cartoon Network. USA Today reported that the Cartoon Network will give Clone Wars the biggest launch in its network’s history in hopes that it can catch up to the likes of the Disney Channel and Nickelodeon. If you remember the Clone Wars shorts from a few years back, you might be confused why Lucas is making another Clone Wars series. Money, you idiots, he likes money. Oh, I mean that Lucas probably wants to enrich the lives of countless fans with more adventures from a galaxy far, far, away. Yeah that’s probably it. Instead of a crappy anime looking version, we’re getting, uh, a version that Lucas himself said was inspired by the 1960s Thunderbirds minus the strings. While the cartoon style doesn’t look that bad, I couldn’t help but roll my eyes when he said he didn’t want it to look like the Incredibles. Yeah, I wouldn’t want it to look FREAKIN’ awesome or nothing. I swear Lucas is insane. Too much flannel or mousse perhaps? 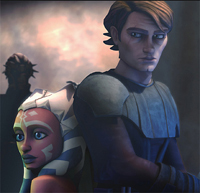 Just so you don’t think Lucas has turned his back on his revisionist ways, we also found out that Lucas has given Anakin a padawan; an 11 year old girl named Ahoska (you can see her in the picture along with Anakin). Why? He’s targeting the show towards 12 year olds as a part of his master plan to enslave a whole new generation of action figure lovers. Maybe 12 year olds are a little more forgiving about the whole “let’s create a new character no matter if it doesn’t make a damn bit of sense” style which Darth Lucas has “mastered”. We sure as heck didn’t see a padawan in Episode III but I’m confident Lucas won’t mind killing off a 11 year old if it puts a few more bucks in his wallet. Clone Wars debuts Friday August 15th. Rider Mother died in child birth his father has kill by bounty hunters a Jedi saved him, the Jedi trained him as a Jedi, when order 66 he fight in the temple but had to run for has life to planet call Concord Dawn is uncle lived here train him to be a Mandalorian. Jim a time team up we Boba Fett, in a mission Jim find Delta Squad and than all team up with Jim and his uncle as the new Delta Squad for the Mandalorians, on Mandalorians mission make new allies, battle meaning emery’s. Years passed Jim and Boba, team up with Lord Vader on a mission. Year’s part is friends and family kill by bounty hunters, Jim hunted him all down kill them, than train a new Delta Squad.